Jerusalem District Attorney files indictment against nine haredi protesters. The Jerusalem District Attorney submitted on Sunday an indictment against nine suspects charged with participation in rioting at Jerusalem's Bar Ilan Junction. The riots were held on March 28 in protest of the IDF drafting haredi soldiers. 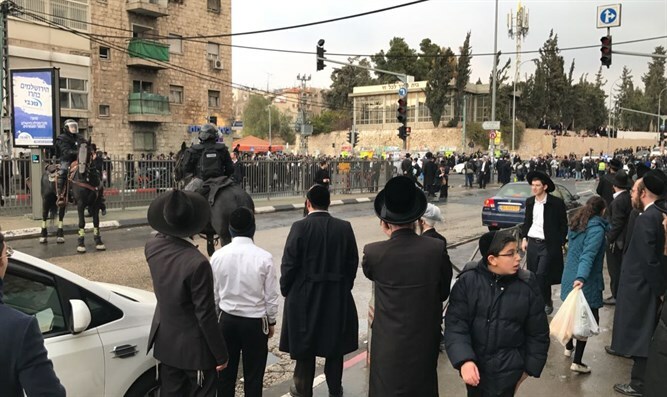 According to the indictment, the nine suspects are charged with disrupting order at Bar Ilan Junction during a protest against drafting haredi men into the IDF. They are also being charged for canceling a convention which was scheduled to be held the same day. The disruption of order including blocking roads by standing, sitting, and dancing in the middle of an intersection, preventing vehicles from continuing their journeys. While doing this, the demonstrators cried, "Redeem the prisoners of Zion!" "We'll die before we enlist," and "Enough with the decrees of destruction!" The protesters also threw stones and water at policemen, as well as spat at them. Israel Police ordered the group to disperse, but the demonstrators did not listen to instructions. One of the suspects stood near Tzefanya Street, next to Bar Ilan Junction, and blocked the path with his friends. A policeman who was at the scene to ensure the street remained open asked the suspect several times to step onto the sidewalk. However, the suspect refused to listen, and the policeman was forced to physically drag him onto the sidewalk and out of the street. The suspect then attacked the policeman by punching him in the shoulder.